Tonight: Mostly cloudy. Lows in the low 30s. Sunday: Mainly cloudy. Chilly. Highs in the mid 40s. Monday: Sunny. Cool. Highs in the mid to upper 40s. Clouds are winning out this weekend as cold air drains south across the New England. Even though the clouds appear to be a precursor to unsettled weather, we won’t be wet OR white this weekend. November was relatively cool, but also inactive. Boston experienced a 2.19” precipitation deficit during the month. Temperatures finished off one degree below average. This was the first “below normal” month since July. Other weather appears to turn a bit more unsettled later this week. A significant Great Lakes low pressure system will push a cold front through New England Tuesday into Wednesday. Temperatures ahead of the front will climb into the upper 50s and low 60s! Up to an inch of rain is possible. Winds will also be fairly strong ahead of and behind the front. At this point, wind gusts may exceed 45 MPH. We catch a break in between storm systems on Thursday. Temperatures will be much cooler. High temperatures will only reach the upper 30s to around 40°. Clouds will win out since this are of high pressure is weak and short-lived. Another storm system will move in late Friday into Saturday. It won’t be all that strong, but there is the chance we could see some snow. If the precipitation mainly falls Friday night, there's a higher possibility of seeing snow. It’s way too early to talk about accumulations, but it is a possibility. Another thing we need to watch: astronomically high tides. That coupled with rising sea levels could lead to coastal flooding, which will be a concern Sunday, Monday and Tuesday. We are forecast to experience minor flooding at some locations during the times of high tide. 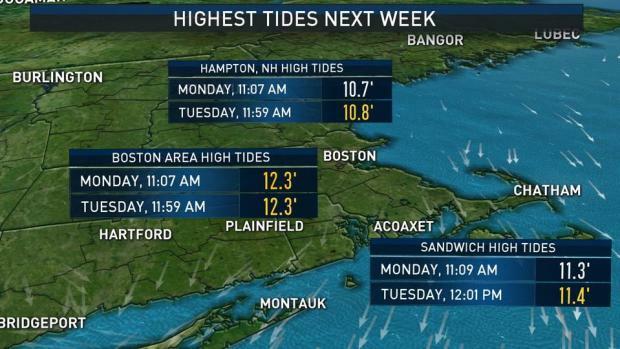 Thankfully, these high tides won’t coincide with any major coastal storms.